BearPaw Outfitters ? 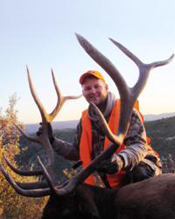 A premier Western States hunting guide and outfitter specializing in Utah, Montana, Washington, and Idaho. They guide for all big game species including deer, elk, pronghorn, moose, sheep, bison and goat. BearPaw Outfitters has been offering hunting trips for over 30 years and has been so successful that they have been able to expand their operation into several Western States. 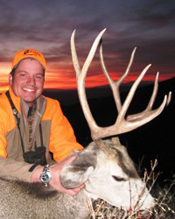 As a Utah Outfitter and Guide, they offer fully guided hunts, semi-guided hunts and even some drop camps. Accommodations can range from a comfortable heated tent on the mountain to a motel close to the hunting areas. They guide for most every species Utah has to offer specializing in deer, elk, moose, bighorn sheep, pronghorn, bear and cougar. Although BearPaw hunts almost every unit in the state, they focus their attention on the Book Cliffs in eastern Utah and the Wasatch Mountains in central Utah. Both of these areas have produced some outstanding trophy bull elk. However, beyond the elk hunting, the Book Cliffs also offers some exceptional mule deer hunting along with cougar and black bear while the Wasatch Mountains also holds some giant bull moose, mountain goat, black bear and cougar. BearPaw has hunting guides experience with each of these species and hunting units. With 30 years of guiding experience, you can be assured that BearPaw can design a hunt that fits your hunting expectations. Check out their website at BearPaw Outfitters or contact Hunters Trailhead for more details.